There are an amazing number of organizations and individuals working to protect, conserve and enhance our unique landscape within the TRB. The following Projects provide information to better identify the who, what, and where of conservation action. This information will help you to know who has expertise you may tap into, gain knowledge on lessons learned from the field, and in turn enhance the efficiency and effectiveness of your actions. Developing IBI's for strategic watersheds statewide. Derived resources will include data sets, imagery, maps, videos, and general and technical reports. Reintroduction and management of a highly endemic and endangered species to the TN Barrens. Derived resources from this project include/will include data sets, general report, and news announcement. In 2005, an improved flow regime was established in the Cheoah River and other habitat improvements are currently underway as part of the Federal Energy Regulatory Commission (FERC) Relicense Agreement. Restoration of multiple species, including Appalachian elktoe, Alasmidonta raveneliana (Fed. & NC Endangered); Spotfin chub, Erimonax monachus (Fed. 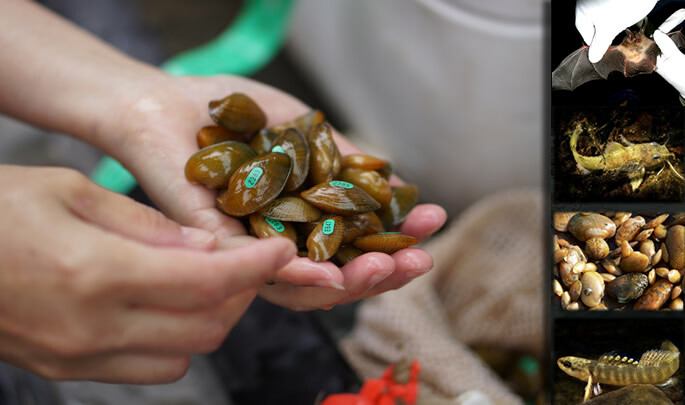 & NC Threatened); Wavy-rayed lampmussel, Lampsilis fasciola (NC Species of Concern); and Rainbow mussel, Villosa iris (NC Species of Concern), are part of the cooperative restoration plan for the Cheoah River. Clinch Powell Clean Rivers Initiative is a two-state watershed collaborative aimed at improving the condition of the globally significant Upper Clinch and Powell Rivers. Larvae were obtained from female golden riffleshells and transformed using the invitro process at the Center for Mollusk Conservation facility in Frankfort, Kentucky under the guidance of Dr. Monte McGregor of the Kentucky Department of Fish and Wildlife Resources. Guided snorkeling programs demonstrate your commitment to managing the land and water in your care while highlighting a fun, safe activity in a clear, cool stream. You can help get people outside, unplugged, and immersed, teaching people of all ages about the wonderful wildlife that lives just beneath the surface of their local waterways. To provide outdoor, environmental and water quality focused hands-on education for kids in school. Education is provided through camps that are held multiple times per year in different watershed areas within and surrounding Chattanooga, TN. This is an extension of the effort to reintroduce Lake Sturgeon (Acipenser fulvescens) to the Tennessee River system. Lake sturgeon are reared in hatcheries in Georgia and North Carolina from eggs and milt collected from Wisconsin. Those fish are stocked in the French Broad River north of Asheville, NC. The objective is to establish a self-sustaining population in the French Broad river upstream from Douglas Dam. This project will implement stream habitat restoration in Martin Creek, a priority conservation area in the Powell River watershed. The project will also involve agriculture best management practices and biological monitoring. To increase the quality of the water within the Mountain Creek watershed, by forming alliances through education and outreach, in order to implement projects that restore water quality. Since 2004, the NCWRC has extended the interstate project to restore aquatic fauna to the Pigeon River into the NC portion of the impacted reach. From the early 1900's thru the early 1990's, the Pigeon River was severely polluted by effluent from a paper mill at Canton, NC. Changes in the paper bleaching process and improved waste water treatment resulted in improved water quality in the reach between Canton, NC and Newport, TN. While habitat conditions improved, many species of fishes and mussels did not begin to recolonize the river due to dams and reservoirs that isolated the reach from source populations that might naturally recolonize. Cooperators in TN began to reintroduce several species of snails, mussels, and fishes beginning in the mid-1990's. Since 2004, six fish species (Gilt darter, Banded darter, Silver shiner, Tennessee shiner, Telescope shiner, and Bigeye chub) have been successfully reintroduced and maintain self-perpetuating populations. A working group of partners has been actively engaged in actions to study and conserve the narrowly endemic Sicklefin redhorse since the early 2000's. In 2015, that was formalized into a Candidate Conservation Agreement. This Candidate Conservation Agreement (CCA) for the Sicklefin Redhorse (Moxostoma sp.) has been developed as a cooperative effort among tribal, state, federal, nongovernmental, and private organizations to establish a formal agreement to cooperate on actions that conserve, manage, and improve Sicklefin Redhorse populations range-wide with the goal of working to preclude the need to list the species under the Endangered Species Act. Activities include research to better understand the life history, ecology, habitat requirements, etc; population monitoring; captive propagation; and reintroduction and augmentation to expand the occupied range. Water quality data collection, analysis and reporting for selected impaired streams on Signal Mountain. Hands-on, outdoor, water-quality education provided to local school. A data-driven prioritization of 290 huc-8 watersheds on the basis of fish, crayfish, and mussel biodiversity, endemism, and imperilment. Spivey Mill Dam is a significant fish passage barrier in Copper Creek, one of the most biologically significant tributaries in the Clinch River basin. This project will involve modification to the dam structure to minimize the impoundment and improve water quality, and river restoration to facilitate fish passage, provide in-stream habitat, and stabilize the channel. The project includes a year of pre-monitoring data, including assessment of water quality, biological communities, and sediment transport. The project focuses on reducing sedimentation in the upper Clinch River watershed through streambank stabilization projects. Methods will include bioengineering techniques, grading, and installation of toe protection. Projects will be concentrated in developed areas of the watershed, as well as collaboration with the local soil and water conservation district.